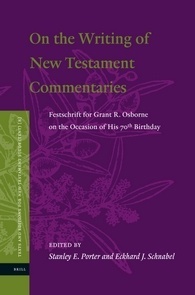 Some who attended the recent Evangelical Theological Society meeting may be aware that Grant Osborne was surprised with a Festschrift entitled On the Writing of New Testament Commentaries: Festschrift for Grant R. Osborne on the Occasion of his 70th Birthday edited by Stanley Porter and Eckhard Schnabel and published by Brill. It will be too pricey ($228) for most of the readers of this blog but here is the table of contents for the volume. Maybe the kind Brill folks will see this and send me a copy of this volume but I doubt it!